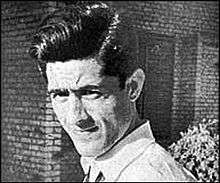 Jalal Al-e-Ahmad (Persian: جلال آل احمد‎‎; December 2, 1923 – September 9, 1969) was a prominent Iranian writer, thinker, and social and political critic. He coined the term Gharbzadegi - variously translated in English as "westernstruck", "westoxification", and "Occidentosis". Jalal was born into a religious family in Tehran. He was a cousin of Mahmoud Taleghani. His father was an Islamic cleric originally from the small village of Owrazan in Taleghan mountains. After elementary school Al-e-Ahmad was sent to earn a living in the Tehran bazaar, but also attended Marvi Madreseh for a religious education, and without his father's permission, night classes at the Dar ul-Fonun. He went to Seminary of Najaf in 1944 but returned home very quickly. He became "acquainted with the speech and words of Ahmad Kasravi" and was unable to commit to the clerical career his father and brother had hoped he would take, describing it as "a snare in the shape of a cloak and an aba." He describes his family as a religious family in the autobiographical sketch that published after his death in 1967. In 1946 he earned an M.A. in Persian literature from Tehran Teachers College and became a teacher, at the same time making a sharp break with his religious family that left him "completely on his own resources." He pursued academic studies further and enrolled in a doctoral program of Persian literature at Tehran University but quit before he had defended his dissertation in 1951. In 1950, he married Simin Daneshvar, a well-known Persian novelist. Jalal and Simin were infertile, a topic that was reflected in some of Jalal's works. He died in Asalem, a rural region in the north of Iran, inside a cottage which was built almost entirely by himself. He was buried in Firouzabadi mosque in Ray, Iran. Commons and his wife ,Simin, believe he was poisoned by Savak. In 2010, the Tehran Cultural Heritage, Tourism and Handicrafts Department bought the house in which both Jalal Al-e Ahmad and his brother Shams were born and lived. "The poisonous culture of imperialism [is] penetrating to the depths of towns and villages throughout the Muslim world, displacing the culture of the Qur'an, recruiting our youth en masse to the service of foreigners and imperialists..."
and became part of the ideology of the 1979 Iranian Revolution which emphasized nationalization of industry, independence in all areas of life from both the Soviet and the Western world, and "self-sufficiency" in economics. 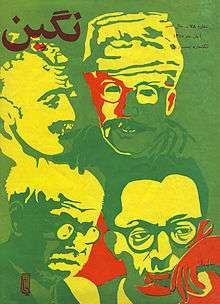 Al-e-Ahmad joined the communist Tudeh Party along with his mentor Khalil Maleki shortly after World War II. They "were too independent for the party" and resigned in protest over the lack of democracy and the "nakedly pro-Soviet" support for Soviet demands for oil concession and occupation of Iranian Azerbaijan. They formed an alternative party the Socialist Society of the Iranian Masses in January 1948 but disbanded it a few days later when Radio Moscow attacked it, unwilling to publicly oppose "what they considered the world's most progressive nations." Nonetheless, the dissent of Al-e-Ahmad and Maleki marked "the end of the near hegemony of the party over intellectual life." He later helped found the pro-Mossadegh Toilers Party, one of the component parties of the National Front, and then in 1952 a new party called the Third Force. Following the 1953 Iranian coup d'état Al-e-Ahmad was imprisoned for several years and "so completely lost faith in party politics" that he signed a letter of repentance published in an Iranian newspaper declaring that he had "resigned from the Third Force, and ... completely abandoned politics." However, he remained a part of the Third Force political group, attending its meetings, and continuing to follow the political mentorship of Khalil Maleki until their deaths in 1969.In 1963, visited Israel for two weeks, and in his account of his trip stated that the fusion of the religious and the secular he discerned in Israel afforded a potential model for the state of Iran. Despite his relationship with the secular Third Force group, Al-e-Ahmad became more sympathetic to the need for religious leadership in the transformation of Iranian politics, especially after the rise of Ayatollah Khomeini in 1963. Al-e-Ahmad used a colloquial style in prose. In this sense, he is a follower of avant-garde Persian novelists like Mohammad-Ali Jamalzadeh. Since the subjects of his works (novels, essays, travelogues and ethnographic monographs) are usually cultural, social and political issues, symbolic representations and sarcastic expressions are regular patterns of his books. A distinct characteristic of his writings is his honest examination of subjects, regardless of possible reactions from political, social or religious powers. On invitation of Richard Nelson Frye, Al-e-Ahmad spent a summer at Harvard University, as part of a Distinguished Visiting Fellowship program established by Henry Kissinger for supporting promising Iranian intellectuals. Al-e-Ahmad rigorously supported Nima Yushij (father of modern Persian poetry) and had an important role in acceptance of Nima's revolutionary style. Many of his novels, including the first two in the list above, have been translated into English. "Kharg Island, the unique pearl of the Persian Gulf"
The Jalal Al-e Ahmad Literary Award is an Iranian literary award presented yearly since 2008. Every year, an award is given to the best Iranian authors on the birthday of the renowned Persian writer Jalal Al-e Ahmad. The top winner receives 110 Bahar Azadi gold coins (about $33,000), making it Iran's most lucrative literary award. In some years there is no top winner, other notables receive up to 25 gold coins. Categories include "Novel", "Short story", "Literary criticism" and "History and documentations". The award was confirmed by the Supreme Cultural Revolution Council in 2005, the first award was presented in 2008. ↑ 8 September 2016. "All written relics of Jalal / the author who is not tired of writing". Tasnim. Retrieved 20 September 2016. ↑ Ali Rahnema. Shi'i Reformation in Iran: The Life and Theology of Shari’at Sangelaji. Routledge. p. 54. ↑ J. W. Clinton. "ĀL-E AḤMAD, JALĀL". Encyclopædia Iranica. Retrieved 11 September 2016. ↑ "Photograph of Jalal Al-e-Ahmad's grave". Mehr News Agency. December 9, 2010. 1 2 "Jalal Al Ahmad". Iran Chamber society. Retrieved 22 September 2016. ↑ Iraj Bashiri. "Al-i Ahmad, Jalal". angelfire. Retrieved 22 September 2016. ↑ l-e Ahmad patrimony in Tehran obtained Archived October 13, 2012, at the Wayback Machine. ↑ Adam Shatz, 'Israel’s Putinisation,' The London Review of Books Vol. 38 No. 4 · 18 February 2016 pages 11-12. ↑ "Homa Katouzian on Khalil Maleki | Part 2: Debunking Conspiracy Theory - Tehran Bureau". PBS. 2012-04-16. Retrieved 2013-09-26. ↑ Frye, Richard Nelson (2005). Greater Iran: A 20th-century Odyssey. University of Michigan. p. 103. ISBN 9781568592893. ↑ Al-e Ahmad, Jalal. "The Israeli Republic". Restless Books. ↑ " “War Road” author not surprised over lucrative Jalal award", Tehran Times, November 20, 2011. 1 2 "5000 works compete in 4th Jalal Al-e Ahmad Award", Iran Radio Culture, IRIB World Service, August 17, 2011. Wikimedia Commons has media related to Jalal-e Al-e-Ahmad. Al-i Ahmad, Jalal A biography by Iraj Bashiri, University of Minnesota.